Sometimes I like to go to mangafox to read HQ manga just to.. you know... replicate the feeling of being back in 1996, you know with a 56k modem and 13 inch monitor. Also alternatively you can do it to replicate the feeling of BEING BLIND, that's fun too. ha ha ha. Gosh, this is so.... romantic. Good job Pikari getting the right combo of encouraging and forceful to make sure Dotty doesn't chicken out on us, lol. Mask-clearing can be kindof tricky at first, but it gets a lot easier after a while. Good stuff guys, and I can (finally) comment here! I guess Amanchu! will be a kind of Gunslinger Girl adaptation. Katori Mato is an agent of the japanese military and the girls will be trained to do clandestine targeted strikes, like swimmming up the cooling water canal of a north korean nuclear reactor and blow it up, sabotage Russian Navy ports in the Far East, etc. Eventually they will be ordered to attach limpet mines to a Greenpeace ship, which tries to protect whales from japanese spearmen. This will cause a moral conflict, resulting in a spectacular showdown among the trio. Aria anime director Junichi Sato is now doing The Great Sea Story, where the protagonist girl Marin barely wears anything and passer-by have a constant fixation with her booty. 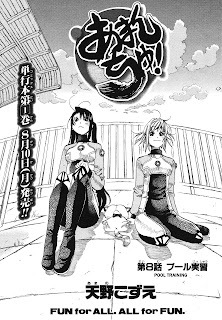 If and when Marin is over, logically Amanchu would be slated next for anime adaptation, since Pikari is not exactly fond of too much garments according to the fanservice illustration. Actually, logically it would still be a few years before Amanchu! gets an anime adaption, purely because there's far from enough material to cover a season. >I guess Amanchu! will be a kind of Gunslinger Girl adaptation. Aria is a kind of adaptation of Biomega. They are on Mars! earth acctually destroyed by Nyaldee. Akari is toha industries agent synthetic human in mars to retrieve N5SV virus. Thanks for the lovely chapter, guys!